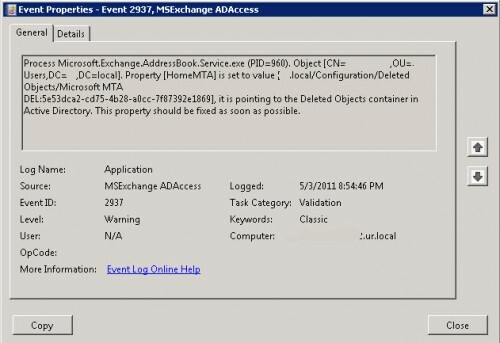 After you have installed Service Pack 1 for Exchange 2010 you find multiple event id 2937, source MSExchange ADAccess warnings. The process and username may vary. Posted in Blog, Exchange 2010 at May 9th, 2011. No Comments. When upgrading your Exchange 2010 RTM server to Exchange 2010 SP1 you need to install a set of pre-required hotfixes. These hotfixes depent on with Operating System you run and witch Exchange roles you have installed on the server. 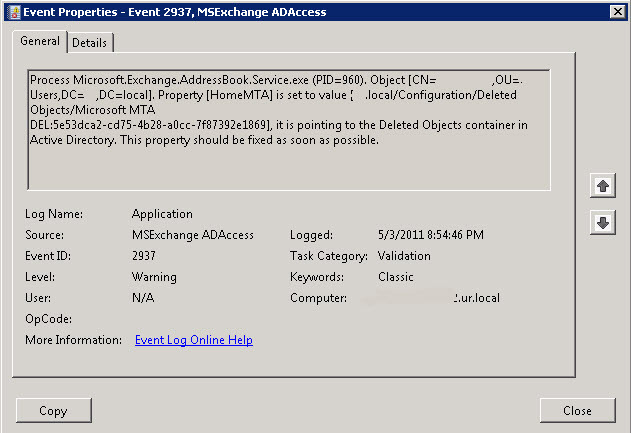 When you start the Exchange 2010 SP1 setup, you first can choose Exchange language option for upgrade. If you run multiple servers you can download the language bundle file from microsoft. So you can point to this file every installation and don’t have to download it multiple times. After you choose the language option you can choose Install Microsoft Exchange Server upgrade. This starts a wizard and after the introduction and license agreement, the readiness checks are performed. This is where setup tells you witch pre-requirements are needed. In my case all servers are running windows server 2008 R2. I have 2 load balanced Client Access / Hub Transport servers and 2 Mailbox servers configured with a DAG. 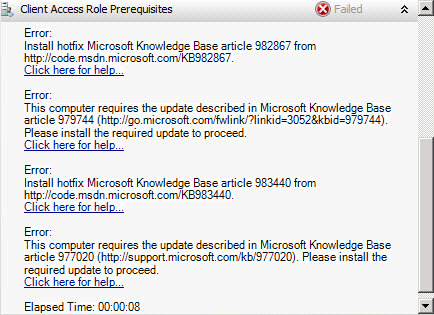 For the Client Access role the following updates are needed: KB 982867, 979744, 983440 and 977020. For the Hub Transport and the Mailbox role only the Microsoft Office 2010 Filter Pack is needed. In my case KB 979099 was already installed by windows updates so wasn’t needed. Posted in Blog, Exchange 2010 at September 15th, 2010. No Comments.